I can't seem to find any information on this, but it appears to be a rather important part of Node.js as I often see it in source code. A reference to the current module. In particular module.exports is the same as the exports object. See src/node.js for more information. But this doesn't really help. What exactly does module.exports do, and what would a simple example be? module.exports is the object that's actually returned as the result of a require call. to export (or "expose") the internally scoped functions myFunc1 and myFunc2. where the last line shows how the result of require is (usually) just a plain object whose properties may be accessed. In simple terms, you can think of required files as functions that return a single object, and you can add properties (strings, numbers, arrays, functions, anything) to the object that's returned by setting them on exports. The difference between exports and module.exports is explained better in this answer here. Note that the NodeJS module mechanism is based on CommonJS modules which are supported in many other implementations like RequireJS, but also SproutCore, CouchDB, Wakanda, OrientDB, ArangoDB, RingoJS, TeaJS, SilkJS, curl.js, or even Adobe Photoshop (via PSLib). You can find the full list of known implementations here. Unless your module use node specific features or module, I highly encourage you then using exports instead of module.exports which is not part of the CommonJS standard, and then mostly not supported by other implementations. When dividing your program code over multiple files, module.exports is used to publish variables and functions to the consumer of a module. The require() call in your source file is replaced with corresponding module.exports loaded from the module. It's possible to use local variables and functions inside a module, not everything needs to be exported. The module.exports object is also available as exports shorthand. But when returning a sole function, always use module.exports. According to: "Modules Part 2 - Writing modules". there is something you must pay more attention : don't override exports . because exports just the reference of module.exports , you can add the properties onto the exports ,but if you override the exports , the reference link will be broken . this module only exposed one function and the property of name is private for the outside . There are some default or existing modules in node.js when you download and install node.js like http, sys etc. Since they are already in node.js, when we want to use these modules we basically do like import modules, but why? because they are already present in the node.js. Importing is like taking them from node.js and putting them into your program. And then using them. Whereas Exports is exactly the opposite, you are creating the module you want, let's say the module addition.js and putting that module into the node.js, you do it by exporting it. Now, this should run successfully without any errors!! Since we are providing the path here by saying it's in the current directory ./ this should also run successfully. 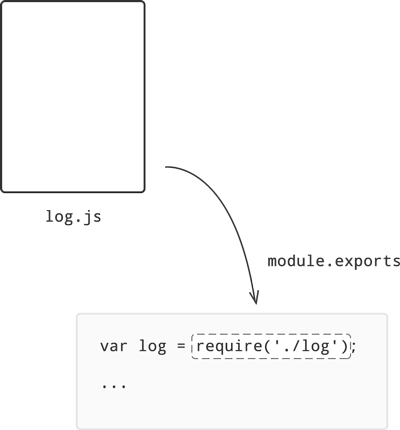 A module encapsulates related code into a single unit of code. When creating a module, this can be interpreted as moving all related functions into a file. We write a function only when utility of the code is more than one call. Suppose we want to increase utility of the function to a different file say World.js,in this case exporting a file comes into picture which can be obtained by module.exports. I imagine it becomes difficult to write a large programs without modular / reusable code. In nodejs we can create modular programs utilising module.exports defining what we expose and compose our program with require. Now try swapping ./stdoutLog.js for ./fileLog.js. What is the purpose of a module system? Keeps our files from bloating to really big sizes. Having files with e.g. 5000 lines of code in it are usually real hard to deal with during development. Enforces separation of concerns. Having our code split up into multiple files allows us to have appropriate file names for every file. This way we can easily identify what every module does and where to find it (assuming we made a logical directory structure which is still your responsibility). Having modules makes it easier to find certain parts of code which makes our code more maintainable. Modules are getting cached. When you are loading the same module in 2 different files the module only has to be loaded once. The second time a require() is called on the same module the is pulled from the cache. Modules are loaded in synchronous. This behavior is required, if it was asynchronous we couldn't access the object retrieved from require() right away. Where does the “exports” define in PhantomJS?